A quick round up of a few little projects that otherwise wouldn't make it to the blog. 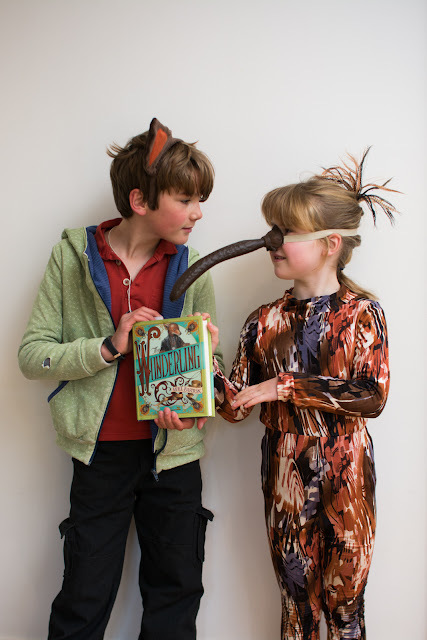 The book follows the adventures of a couple of orphan "groundlings" which are part human part animal creatures. 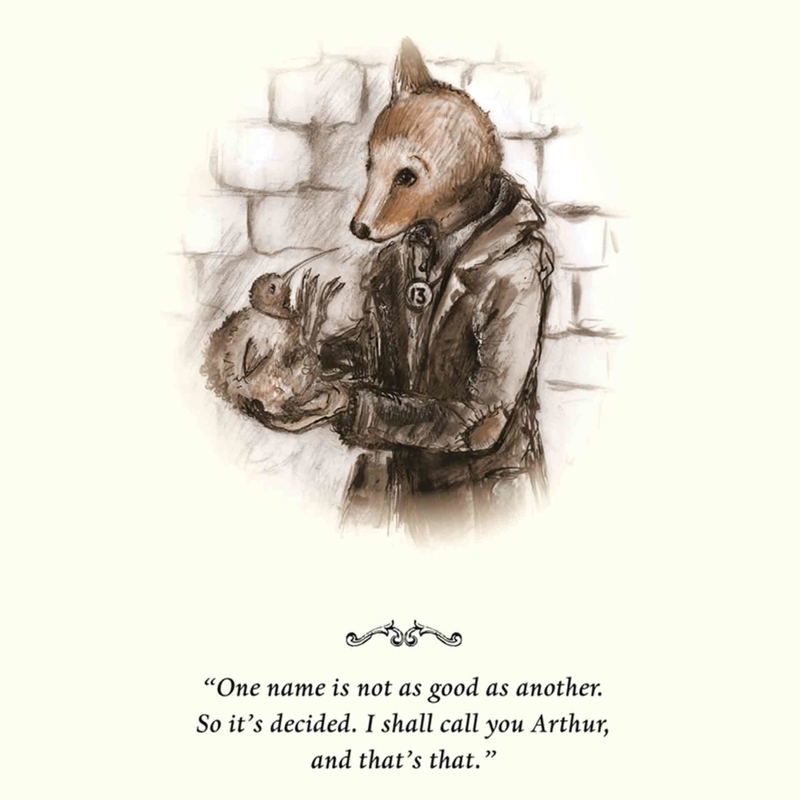 Arthur is a fox groundling with one very large ear and the superpower of amazing hearing. Trinket is his little bird friend who is an inventing genius and does amazing things with her beak. - "It's all in the beak, Arthur, all in the beak"
Anyway to costumes: P was Arthur, a formerly un-named orphan known only by his Number 13 tag around his neck. 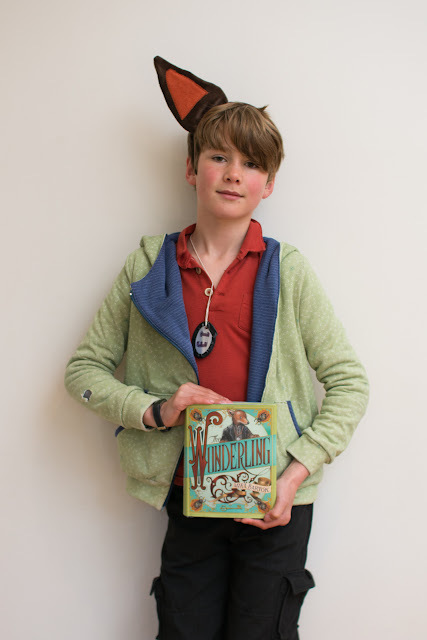 We made that from some metal cut from an aluminium can (Flipper obligingly drank a Coke to help out the kids in their crafting) and then all he needed was one big ear. The stash bucket yielded some foxy coloured fleece knits and a headband to cover. His favourite hoodie is looking suitably old, faded and torn now. Teemed with a foxy coloured Parachute Polo and some Field Trip cargo pants and he was sorted. As a bird, Trinket struck me as very Kiwi like. 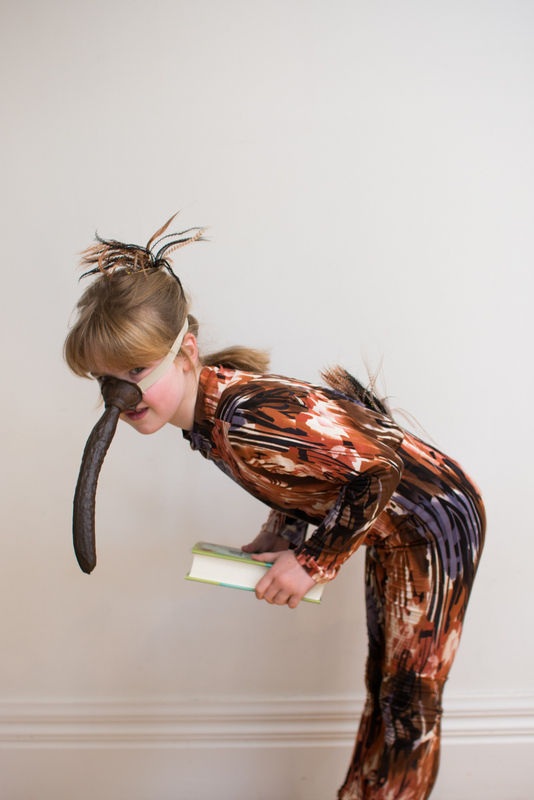 I had a bit of my bird plumage brown knit fabric left from when I dressed as a scrub hen for the theatre (if you're new to the blog that sentence might surprise you, but that's how we roll). Just enough for a long sleeved Tee and some leggings. The body of the T-shirt is pieced in a few spots but the pattern is so busy you'd never notice. Forgive me a little boasting but I am quite proud of that beak! :) It's a styrofoam cucumber that came from the local, weird $2 asian shop that sells all sorts of stuff you never knew you needed. Among the kitchen utensils and placemats were these fake vegetables on strings. A raffia string with five long, green cucumbers attached was just what I needed. A bit of brown paint, a single cone from an egg carton and some elastic and we had a very kiwi-esque beak. The funny, frizzy hair extensions on bobby pins also came from that shop and make perfect fluffy bird bits on head and tail. The only downside is A has decided the other four cucumbers on their string are "lovely" and insists on hanging them in her bedroom. Sigh. Pattern wise the top is the Oliver + S School Bus T-shirt, size 8, with the neckband made into a higher skivvy neck with a slight cowl twist. The leggings are from a Japanese pattern book and I'd previously made another pair so the pattern tracing was already out. They're size 130cm which is her height and measurements but they're really long. For the bird ones I just left them long, as I'm sure kiwis have slightly wrinkly ankles, right? But for these blue ones I'd thought it would be fun to try and gather them and use some of this vertical bow ribbon that I've had in the stash for ages. 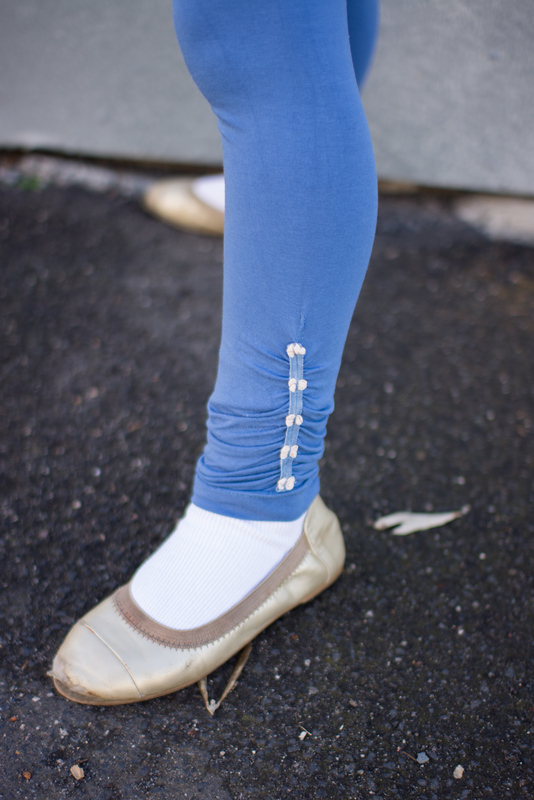 This leggings pattern was tried to see if it solved some of the crotch fit issues of the jeggings I'd made based on the Oliver + S Playtime leggings. It doesn't really, so I'm thinking the Jalie Eleonore pull-on jeans might be the pattern for stretch jeans/jeggings. Of course that's one I don't (yet) own. But that's also how I roll.... right? OMG they look amazing, that ear and the nose - you certainly have the knack to think outside the box. Ha ha, thanks Sharon. I love a challenge as much as I love a good book. And now I finally know why fake vegetables still sell. Great costumes as always! That book sounds quite interesting. I happen to be reading R Oliver Twist at the moment so maybe I should look into it as a follow-up! As for fake vegies, I can't tell you how many times I've been tempted to add a fake food item to my kids' school lunches, so there's one use you might not have thought of!